I had originally planned to let the Hoyo du Maire, which I have posted about recently, rest a month or so before trying them. As with all good intentions I could not resist temptation, and having a work trip to Scandinavia to look forward to, I packed one in my small travel humidor. Thanks to the lovely (hah!) weather, I found myself having to wait for longer than planned to board my plane and so I decided to make good use of the time and light up the Hoyo du Maire . A note before I start: I would like to than both Trevor and Yorgos for their opinions on the age of the Hoyo du Maire. They don’t agree (2002-2003 according to Trevor, post 2005 for Yorgos), so I am still slightly at loss regarding the age, but I appreciate the input greatly. I won’t go through the History of Hoyo de Monterrey, which is well documented elsewhere, but just a quick note on the Le Hoyo Series. This was created in the late ‘40s (although some web pages mention the ‘70s) as a more full-bodied line for A. Durr Co., a Swiss distributor. Originally comprising 6 vitolas, it is now down to 4 after the discontinuation of the Hoyo du Roi and Hoyo du Dauphin in 2009 and 2003 respectively. As with other small ring gauge Cubans, this has a rather wrinkly and slightly veiny wrapper, claro, with a few cracks from the age. Considering these are hand-made I can only imagine how hard it might be to get these to be perfectly smooth. Feel is perfect, with a right amount of give. The pre-light draw is nice and free, with a faint woody note. It might seem strange to talk about flavour evolution in such a small cigar, but there is an evolution here that some bigger cigars could do with. The start is very unusual. Together with notes of Cuban tobacco and milky tea, there is a clear note of pine (resin?) in the background. It is perfectly smooth. The draw is loose and the ash is solid but quite short. On such a lean stick the burn seems lopsided with the slightest deviation from a perfect line, so while it isn’t perfect it needs no attention. The milky tea taste is still there, but now there are nutty and slightly salty notes (salted almonds maybe?) to keep it company. The draw becomes a bit tighter and the ash more solid and longer. The finish has more of the aromas I have found associated with the Le Hoyo range: nutty woody and with a hint of spice, but keeping very smooth all the way. This is certainly a very nice short cigar, which has aged well (whatever its age might be!) and gets a good 86 Points. Would I buy a box of these? Probably not, at least not with the budget I have. Considering the price there are other more convenient short Cuban cigars I would rather go for, but if you like short thin smokes and find a deal on these, give them a go and possibly some aging. Having said that I am happy to have another 4 in my humidor and I’ll certainly be enjoying them. More reviews of the Hoyo du Maire here. 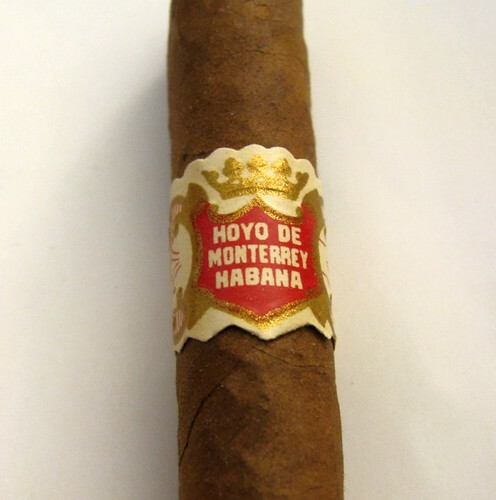 This entry was posted in Cigar Reviews, Cuban and tagged Cigar Review, Cuban, HdM, Hoyo de Monterrey, Hoyo du Maire. Bookmark the permalink.